✔ LIGHT AND DURABLE RESIN MATERIAL: The Outsunny 26″ Three-Pitcher Pouring Indoor/Outdoor Water Fountain is manufactured from high quality resin, making it lighter and more practical than stone. ✔ COMPACT SHAPE: This compact pouring jar shaped fountain is ideal for use as a natural garden installation and adds beauty without taking up too much space. 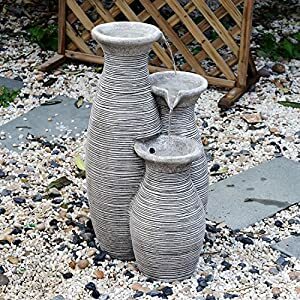 ✔ POURING JUG DESIGN: It features a vase-like design that adds a sense of tranquility to your garden as water pours from one jug to the next and back again. 325 queries in 0.702 seconds.